I am thrilled to announce that the first issue of the new quarterly journal Incognitum Hactenus (edited by Tom Trevatt and myself) is now available! Download it here. 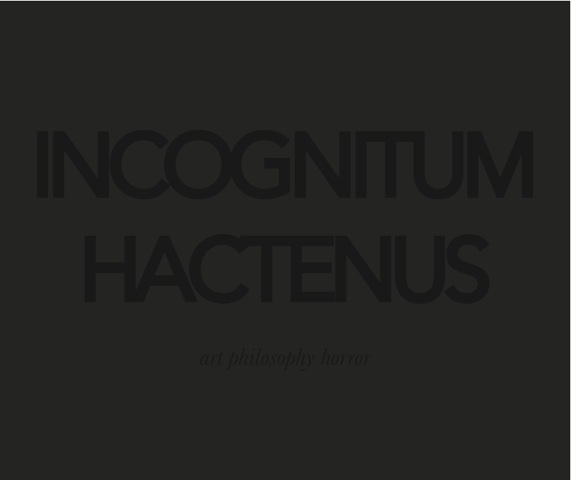 Volume 1.1 “Real Horror” of Incognitum Hactenum includes texts and artwork by Amanda Beech, Simon Clark, Carl Neville, Ben Rivers, Steven Shaviro, and Ben Woodard that were produced in conjunction with The Real Horror Symposium last October in London. Please visit the website to download the first issue and to learn about the journal. We hope that you enjoy and participate in these new strains of discussion as we celebrate the present, past, and future of art, horror, and philosophy! journal on art is my favourite occupation. I am more interesting to do it.